Looks like I might be running Lacuna for the first time in the near future. Would anyone care to throw a few adventure seeds (or advise) my way? I love this game, but I'd like to do it justice. The only thing I've got subscribed is more rules advice than anything, but is linked here. Personally, I think pacing's pretty important. As I usually have to keep each game to about two hours, I make the players roll for pretty much everything. Climbing over fences, breaking down doors, finding evidence, etc. Basically, bear in mind that the more they roll, the higher their heart-rates climb. The mechanics take care of the rest. Also useful is making a Static Chart before you start (an example's on p.31 of the rulebook), so you're not totally making things up on the fly (took me three games to master this). Your first mission should probably just be a standard mission: Go into Blue City - Find this guy - Send him to the Lacuna - Eject. You can start trickling in bits of 'metaplot' later (and remember that the 'canon' is totally up to you). Oh, and you can also send the players here beforehand to introduce the theme (and mess with their heads) before you even begin. EDIT: Oh, also, for inspiration, you might want to check out the AP links on the Memento Mori site. Many thanks for the advise and links! I don't know if it helps, but here is how I have run Lacuna. I start with a case file. Then come up with complications and static. I play some surreal music lightly in the background, along with a looped thunderstorm. 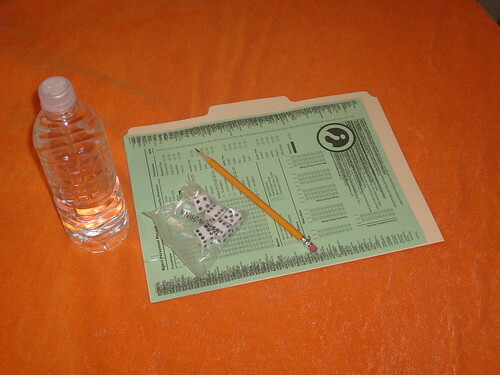 I gave the case file to the players in a manila folder along with their character sheet. I printed it on green paper. I also insisted that they bring nothing to the table. No drinks, no dice no pencils. Here is what they found awaiting them. I've got a couple of Lacuna AP threads over at Story Games. I, and others, track static in front of the players. They have no idea what it is or why it's accumulating, but it really amps up the tension. I made a row of glass beads and man it freaked them out. That's awesome!... thanks so much for sharing that info'. It's greatly appreciated. Love the glass beads idea for static... as well as doing in front of the players. Very clever.... Devious one could say. Well I havnt played Lacuna as published but I have used Lacuna's setting for a Con X Witchcraft Game. If you have WC & Con X I can give you some advice also I converted Harterate & Static to Unisystem. Luck me - I have both of those games! Any info would be cool - much appreciated. I sent you a pm re. the other games btw. Here are some of my unpolished conversion Notes. Pulling Strings could be used to simulate Lacuna's Access rating giving Agents some measure of control over the Blue City with some minor modifications.I will work on that idea if I ever get the chance to run the Game with my new Group. Also if your Lucky enough to own All Tomorrow's Zombies & Enter the Zombie you could easily turn the Con X/Lacuna Game into a Matrix Type Game near the end. Damn I wish I had made a play report for that Game. I put together a first session for a single-player game (Kaufman is the PC, Baker and Coker are NPC mystery agents), although it should be pretty easy to mine for ideas. I think a list of surreal elements to drop in would help by way of prep as well. -	Hacked up a young couple hitch-hiking, hid the parts in a deep freezer, picked up by the police after traffic inspector noticed odd stains on the back seat of his car. -	Maria the Match Seller – being accosted by couple of militiamen. Matchbook emblazoned with a symbol of the Tourist Bureau: stylised train disappearing into a setting sun – go there. -	Explodes in a butcher’s shop, scattering body parts of man and beast across the street. A couple of people stagger out, dazed and mutilated. -	Inez will hand Kaufman a brown package containing the parts of a sniper rifle, with a photo of Fleischer/Crossley. She implores she kill ‘the foreigner’ instead of just ‘taking him away’. -	If Kaufman doesn’t follow up the lead, Fifth Columnists will drive by and try to abduct Kaufman (or Baker, as hostage), wearing bandannas and driving a stolen postal van. -	The Fifth Column refer to Kaufman as ‘one of us, once’ and a ‘kindred spirit’. All Fifth Columnists are latino or have Spanish names, although no one seems to remark upon this.